To be honest, the way I rabbit on sometimes you’d think that ought to be the name of the blog (I do like lots of stuff published after 2000, trust me on that!). I’m afraid I’ve unearthed another oldie, an arcade machine this time, which I decided to try based on the unpromising premise that the Spectrum conversion got a bit of a rubbish review in CRASH magazine: Mag Max. First things first: remember the way the ground scrolls in perspective in Street Fighter II and how that looked pretty awesome back then? Well, this game does that too with the entire play area and it came out in 1985. That’s not bad going is it? Something for the programmers to stick on the CV: did the SFII scrolling before first. But you can’t judge a game on its fancy graphical flourishes so how does Mag Max play? At heart it’s a reasonably-tough side-scrolling shooter with a wee space ship that scoots along the ground, so far so half of the games from 1985. Where’s the unique selling point? Well, the Mag Max one is delightfully daft: the wee ship you control is not all it seems, it’s actually just one part of a big robot. You see, whilst travelling through the level other bits of robot appear: things like a head and arms, a big chest-gun and, of course, a pair of legs. The head and legs don’t appear to have to be collected in any order and as well as providing extra fire power and making the player look a bit more impressive (or ridiculous if you’re slightly cynical in which case piss off and play CoD or something) they provide armour of sorts; if you get hit then you lose the various extra parts of the robot piece-by-piece until just the ship is left at which point another hit loses the player a life. But that’s not all – dotted around the level are metal-ringed holes in the ground which open and close, fly the ship over them whilst open and the player is transported to a subterranean side-scroller this time with the ship/robot in the air rather than skimming over a fancy-perspective surface meaning play feels more in line with the likes of Nemesis. Whilst the overground bad guys tend to be bullet-disgorging gun emplacements here aliens in attack waves are more the norm along with red stalegtites which the player can crash into if not shot away (and, in an excellent touch, net 1000 points if they hit an enemy on their way down). Naturally, there are holes in the ceiling at intervals which can be flown-into to return to the above-ground view. The subterranean scrolling level on the underrated Spectrum version. 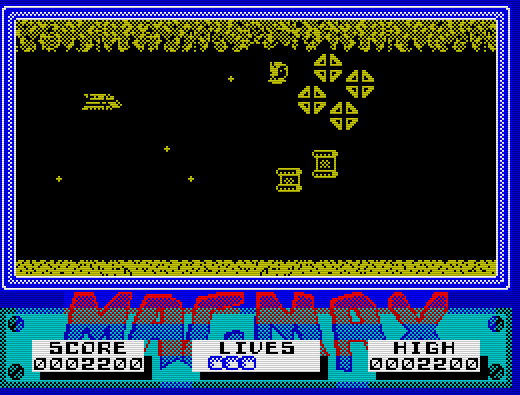 Mag Max is fun, addictive and very very ’80s. The overground/underground (but no wombling free) aspect to each level as well as the “collect parts of the robot” feature provides variety and helps make what could be just another mid-80’s highscore game something a bit more special. And, to my surprise, the Spectrum conversion actually isn’t that bad at all and is an amiable and playable (if predictably colourless) attempt at recreating the arcade game on 1982-vintage British budget hardware. 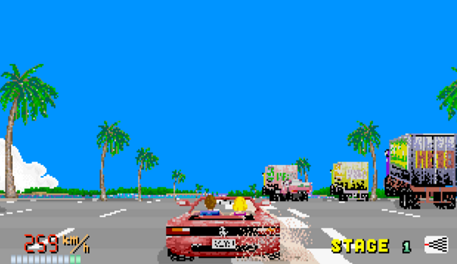 The game was also ported to the Commodore 64 and NES although I’ve not played those versions and so can’t comment. Given that both machines were pretty good when it came to scrolling shooters, though, I doubt they’re shite. So, yes, overall Mag Max is a whole bundle of silly highscore fun with a massive robot in it. 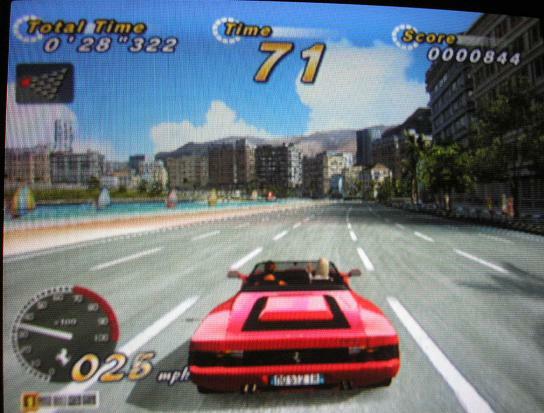 Just one thing: the ingame music in the arcade version is complete arse. The sort of jolly, plinky-plonky stuff that’s more at home accompanying big-eyed cartoon children bouncing through fields and collecting magic raspberrys or something. What woz they thinkin’? East Germany! What do you think of when East Germany is mentioned? Probably Trabants, political repression, That Wall and athletes using steroids. Do you think of games, though? You probably don’t because, let’s face it, apart from Tetris the old Eastern Bloc wasn’t that well known for videogames. But is that fair? Was the German Democratic Republic and the like actually churning out great games that we in the West simply ignored because they were designed to play on 1Mhz computers the size of a casio keyboard which needed to warm-up for ten minutes first? Some good films came out of the Communist world after all (I’m thinking of the likes of Solaris rather than all those ones about the grain harvest). There’s one way to tell, play Poly-Play, the popular  video game system created in East Germany by a company called VEB Polytechnik and installed in the youth clubs and sports centres of the GDR so that gamers on the other side of the iron curtain, with their Pac-Mans and their Ghosts & Goblins, could no longer look down on their Eastern brothers. Or at least that was the idea. I was disappointed that this first title is about hunting deer, what’s wrong with hunting capitalists? Their top hats would make them easy to spot and we all know they’d spill coins when you shot them, like some kind of Super Mario baddy. Anyway, for whatever reason the comrade programmers at VEB Polytechnik decided to have the player hunt deer instead. Gameplay consists of moving a wee gun-toting man in a stupid hat around the screen and shooting at a deer. The player has ten bullets and around ten seconds to fire each one or they lose it (I’ve no idea why this is, maybe GDR-built ammunition really was that perishable, shame they didn’t built Trabant bodywork out of the same stuff). The deer “runs” around the screen like, well, a really f**king stupid deer and only changes direction when it hits a tree.The player is not animated as he runs around but the programmers thankfully took the time to give the deer sprite a whole two frames of animation. This is about as exciting as things get. I'm not kidding. If you shoot a deer (not a great challenge, all considered) you score a point and get the lost bullet back which I presume means that comrade hunter goes up to the dead deer and pulls the bullet out of its hide before sticking it back into his rifle; he’ll also be happy to find that being in the deer’s arse has restored the bullets longevity. So you just keep shooting the deer (which, incidentally never seem to get any faster or more numerous). When all the bullets have run out (which will probably only happen because the you get bored of shooting the same easy target over and over again with no challenge and just unload all your bullets into the air), it’s endes des spiels. Hirschjagd is rubbish. It’s really rubbish. It’s not even particularly entertaining as a piece of Eastern Bloc kitsch; I mean, East German fridges and the like weren’t up to the standard of the West’s but at least they’d keep your cold food, at least they basically did what they were supposed to. Hirschjagd just doesn’t seem to work as a game at all, there’s hardly anything to play. 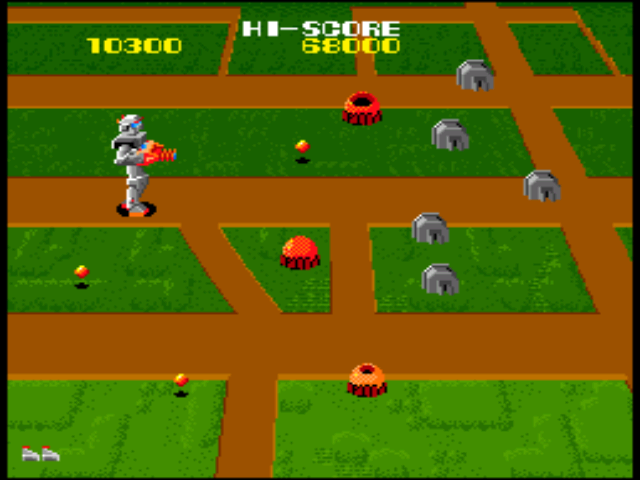 Wikipedia, in its article about Poly Play describes this game as being “similar to Robotron 2024“ , a statement astoundingly untrue even for Wikipedia. I really hope the rest of Poly-Play is better than this. I give Hirschjagd one Karl Marx out of five.